C++ and Beyond is a small, conference-like event built around intensive technical sessions by Scott Meyers, Herb Sutter, and Andrei Alexandrescu, but designed also to facilitate the exchange of experiences and insights among the unusually talented developers who attend. 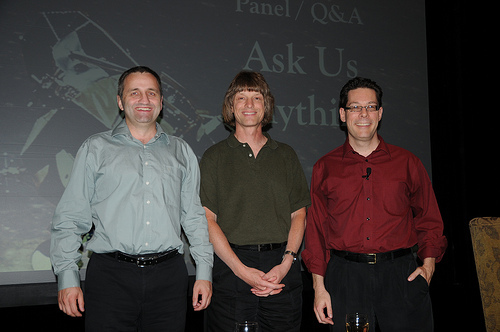 Technical sessions focus on topics of special interest to professional developers where Andrei, Herb, and Scott have expertise. Topics in past years have included CPU caches, lambda expressions, move semantics, CAS-based concurrency, variadic templates, the C++11 memory model, GPGPU programming, code optimization techniques, and the C++11 threading API. For details, consult the full schedules for C&B 2010, C&B 2011, C&B 2012, C&B 2013, and C&B 2014, as well as the selected videos from prior C++ and Beyonds. Scott’s, Herb’s, and Andrei’s backgrounds vary, but these C++ legends have three things in common. First, they’re interested not just in C++, but in how its power can be applied to real and challenging problems. Second, they have an uncanny ability to explain complex technical material. Most importantly, they know how to create an event of enormous value to professional C++ developers, regardless of whether their experience with the language spans one or two years or one or two decades. Scott Meyers wrote the books Effective C++, Effective Modern C++, More Effective C++, and Effective STL. He publishes and maintains annotated training materials dedicated to C++11/14 and to the use of C++ in embedded systems. Herb Sutter wrote four books and hundreds of technical articles on C++ and concurrency. He chairs the ISO C++ standards committee and led or participated in the design of several C++11 features. Andrei Alexandrescu is working in areas as varied as C++, Machine Learning, Natural Language Processing, and design of the D programming language. This work has led to three books (one coauthored with Herb Sutter himself) and numerous other publications. C&B Stuttgart Just Two Weeks Away!